The GLF Tea Store offers special teas from our Seasonal Tea Club. Tea Club members are entitled to a 10 – 25% discount and have the first opportunity to purchase from our limited supply of these amazing selections. Our current special tea is Jin jun mei (pronounced: gin june may) from Fujian Province. 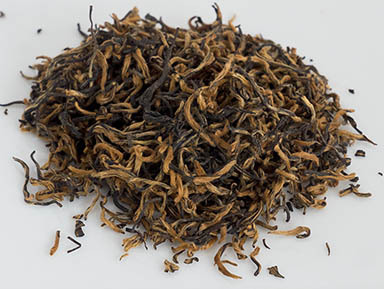 Translated to Beautiful Golden Eyebrow because of the curved appearance, this black tea is among the highest valued teas in China due to its sweet and slightly smokey notes. Brewing is fast…only 5 to 10 seconds of boiling water (always use spring water if available) will provide 10 to 15 infusions per 5-grams, making the price very reasonable as the cost per cup is low. Minimum purchase is 20-grams, but you can increase the quantity during checkout. FREE shipping on orders over $100.00! Enter the Coupon Code after adding to your cart. Then click the “checkout” button to purchase. Go to your Shopping Cart to checkout.